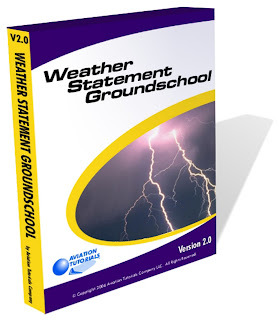 Weather Statement Groundschool is now offering a course on METARS (Aviation Routine Weather Reports) and TAFs (Terminal Area Forecasts) that you can complete on your home computer. METARS include temperature, dew point, wind speed, direction, precipitation, cloud cover, visibility, lightning and barometric pressure. TAFs are used in conjunction with METARS and use similar terminology. Offering instruction that goes beyond rote memorization, the CD-ROM includes nearly two hours of interactive training in which the user can specify weather conditions such as wind speed, gusts and direction, and then see how those conditions appear in the weather statement displayed. A “speak it” button allows the user to hear a verbal translation of codes to truly get a clear understanding of the weather picture. The price is $49, and the product may be purchased at Aircraft Spruce & Specialty.